Map of New York highlighting the Syracuse Metropolitan Statistical Area. The Syracuse Metropolitan Statistical Area, as defined by the United States Census Bureau, is an area consisting of three counties in central New York, anchored by the city of Syracuse. As of the 2010 census, the MSA had a population of 662,577. In the 2000 census, the MSA had a population of 650,154. As of the census of 2000, there were 650,154 people, 252,043 households, and 164,202 families residing within the MSA. The racial makeup of the MSA was 88.36% White, 6.87% African American, 0.74% Native American, 1.61% Asian, 0.03% Pacific Islander, 0.74% from other races, and 1.65% from two or more races. Hispanic or Latino of any race were 2.08% of the population. The median income for a household in the MSA was $39,210, and the median income for a family was $47,862. Males had a median income of $35,698 versus $25,373 for females. The per capita income for the MSA was $19,098. Components of the Syracuse-Auburn Combined Statistical Area. 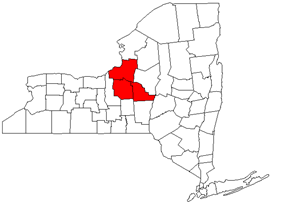 The Syracuse–Auburn Combined Statistical Area is made up of four counties in central New York. The statistical area includes one metropolitan area and one micropolitan area. As of the 2000 Census, the CSA had a population of 732,117 (though a July 1, 2009 estimate placed the population at 725,610).